LobbyI recently went to The London NYC for afternoon tea in the London Bar, which confirmed the fact that I wish I could have afternoon tea daily. Not only do I want scones with every meal, the ritual is always so calming. Nothing bad can happen at afternoon tea. I'm in the midst of planning a two-week trip to England in March, and although there is no sister property in England to The London NYC, I had heard wonderful things from friends that had stayed and wanted to get a better look at this all-suite hotel (read: LARGE ROOMS!) If you're a guest, there are free calls to London from your hotel room! Plus, free WiFi and it's pet-friendly, which I love. Everything feels very English throughout the hotel--refined and beautiful, but a little bit saucy and colorful, with all the interiors done by leading Brit designer David Collins. Living Area in Sky SuiteSome of the suites have gorgeous views of Central Park, the Hudson River, and the George Washington Bridge. 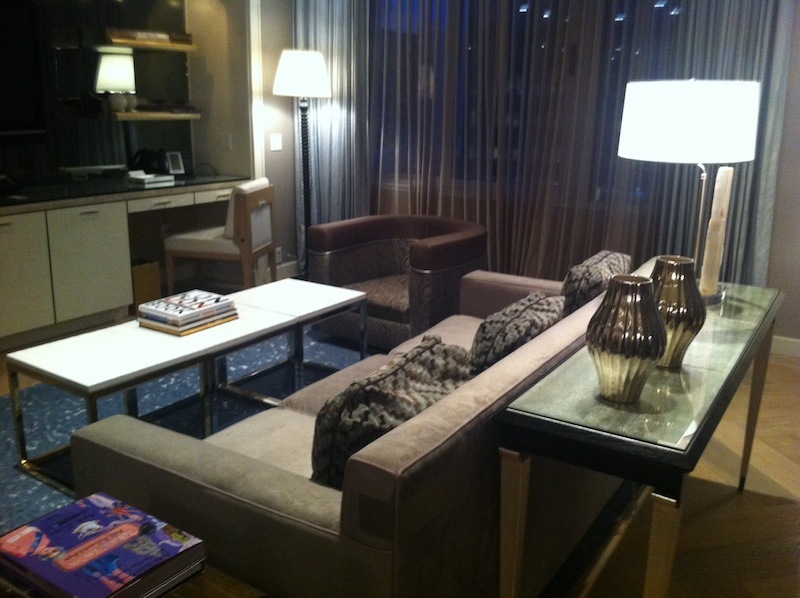 My favorite was the London Sky Suite, with a sophisticated living area and great bedroom. The London NYC has one of the best hotel gyms I've ever seen-huge weight and cardio area, new machines, city views. I wanted to sneak a photo but always feel bad when I'm in there snapping photos and people are sweating on the treadmill.